Doomsday is quickly approaching. Did I say doomsday? Sorry, I mean your wedding day. Count down to the big event with the Countdown to Our Wedding Day Timer. You'll know how long until you say your vows, right down to the second. It's the perfect gift for the blushing bride who can't wait for the day and the groom with cold feet counting every second of his freedom. Time waits for no man and neither will your wedding, so you might as well set it correctly to ensure you'll make it to the church...or the airport...on time. You’ve finally set a date for that glorious day and now you have the timer that will count down the moments to the very second. The Wedding Day Countdown Timer is the perfect gift for that bride to be or anxious husband counting down his last days of freedom. It’s the perfect countdown to happiness. Who Would Love Wedding Day Countdown Timer? 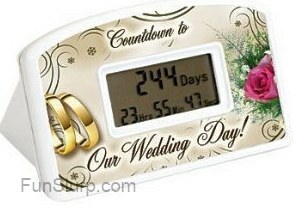 The blushing bride who can’t wait for her big day to come will absolutely love the Wedding Day Countdown Timer. She can spend hours staring at it, knowing her big day is fast approaching. Imagine the joy she’ll have as the months tick down to days and finally hours. She can watch the countdown hit zero just before she steps out onto the aisle. What happens if we haven’t set a date or it changes? Don’t worry, you don’t have to input anything until you’ve finalized everything. Once you have your date, then just sit back and watch as the numbers tick by. You’ll know right down to the second how much time you have to get the dress, find a band, etc. If something comes up and you need to push the date forward or back, it’s easy to reset. My would-be spouse called off the wedding, now what? If your no-longer-soon-to-be spouse decides to call off the wedding, then you can always just throw the clock at him. You know the old saying “Time flies when you’re having fun.” What can be more fun than beaning Mr. McColdfeet with the Wedding Day Countdown Timer? Okay, so don’t do that. Tuck it away and pull it out when Mr. Right pops the question. Slide to Unlock Magnet - Swipe!